Controls the resolution the algorithm will work with. A lower LOD results in a faster render time and larger style features, as a higher LOD takes more time to render and offers smaller style features. 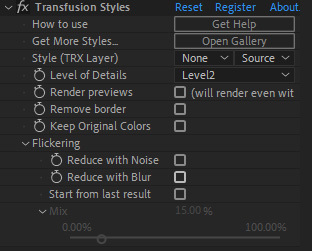 By default, Transfusion will not render when AE downgrades the comp’s resolution by more than 1/4. That means that when “Adaptive resolution” is activated and you scrub through the timeline, Transfusion will not render, letting you scrub through your footage without calling the plugin to render at each scrubbed frames. If you need Transfusion to render in situations of a degraded resolution, check this box. More infos and examples on how to use this feature here. Will add a small amount of blur to the source image, resulting in a smoother and less noisy input, this is likely to reduce or remove noise and grain in video. Will add a subtle static noise pattern over the image. This noise will help the algorithm to stick the style features at the same place on every frame, especially in large and uniform areas. When activated, Transfusion uses the last rendered frame as the input frame, resulting in a much smoother output when working with video. The Mix slider defines how much of the last render is used. Typically, a lower value (between 5 and 20%) is enough to help the algorithm produce a stable result and still keep almost all of the animation.